Original recipe: Epityrum album nigrum variumque sic facito. Ex oleis albis nigris variisque nuculeos eicito. Sic condito. Concidito ipsas, addito oleum, acetum, coriandrum, cuminum, feniculum, rutam, mentam. In orculam condito, oleum supra siet. Ita utito. 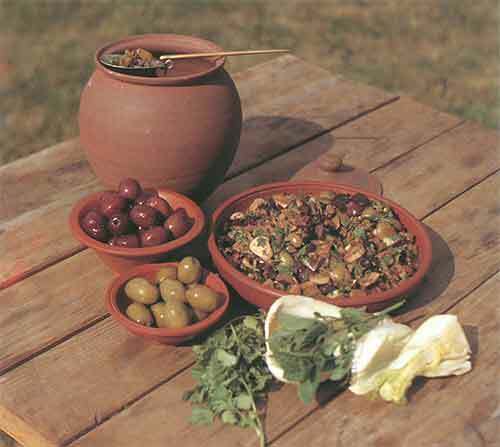 Coarsely chop the pitted olives and finely chop the fennel and herbs and place in clay pot. Add olive oil and vinegar and let the mixture marinate for 1 day. Before serving add the cumin and rue carefully so that it does not overpower the flavor of the other ingredients.